Companions of Walton Chapter No 1086, hosted the third joint convocation of the Woolton Group. All four chapters from the Woolton Group joined forces to stage the joint convocation entitled ‘George Washington’s Masonic apron’. Guest of honour was the Deputy Grand Superintendent Paul Andrew Renton. With all officers in their respective places and with over 70 companions seated, the meeting commenced with first principal Barry Harnick opening the convocation, ably assisted by second and third principals George Strickland and Colin Graham respectively. Provincial Deputy Grand Director of Ceremonies Neil MacSymons entered the chapter and announced that the Deputy Grand Superintendent stood without and demanded admission and first principal Barry answered that the companions would be delighted and honoured to receive him. Paul was accompanied by Assistant to the Provincial Grand Principals Sam Robinson, Woolton Group Chairman Andrew Whittle, grand officers Peter Williams and John James, together with acting Provincial grand officers John Goodrum, John Gibbon, Ian Lynch and Ian Black. Paul was warmly welcomed by the three principals and offered the sceptre by Barry Harnick. Paul took the sceptre as his right and after a few words handed it back to Barry. After Paul had taken his seat, the chapter was then ‘called off’ to allow master Masons to attend the meeting. The narrator Andrew Whittle, began the explanation of ‘George Washington’s Masonic apron’, by warning his audience to expect anything from the companions who were representing the three main characters. David Anderton took the part of George Washington, General Marquis de Lafayette was performed by Peter Connolly and the demanding roll of Madame de Lafayette fell to Paul Sheppard. Pictured from left to right, are: Paul Renton, George Strickland, Barry Harnick, Colin Graham and Sam Robinson. With George Washington welcomed into the chapter, the next to enter was General Marques de Lafayette in military uniform and it was at this time that the two men realized they were both Freemasons and the history of how he acquired the apron from the Lafayette’s was given. General Lafayette offers to ask his wife to make a Masonic apron for Mr Washington. Now it was time for the arrival into the chapter of Madam de Lafayette and the companions were not to be disappointed. 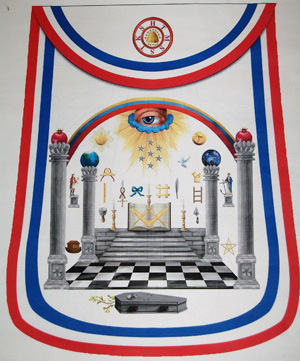 Madame de Lafayette entered waring a fur stall and sowing basket in hand and began making a colourful Masonic apron, at the same time making witty remarks to the companions sat close to her. When the apron was completed it was presented to George Washington and then shown to the companions. History in the making, pictured left to right, are: Peter Connolly (General Marquis de Lafayette), David Anderton (George Washington), Paul Shepard (Madame de Lafayette). ‘George Washington’s apron’ was explained by the narrator, who was assisted by 10 speakers representing the four chapters in the Woolton Group. Each point was highlighted on a screen during the explanation. At the end of the presentation, which was amusing and informative, Barry thanked all those who had taken part. The master Masons were then requested to retire and the chapter was ‘called on’ and then closed, with everyone retiring to enjoy the festive board. At the festive board and in response to the toast to his health, Paul thanked the chapter for their invitation and also thanked Andrew Whittle, the speakers, Mel Cross for the loan of the apron and a big thankyou to the main characters David Anderton, Peter Connolly and Paul Shepard for making it a most enjoyable evening. Paul then asked those master Masons who were present to consider their next step in Freemasonry, by becoming Royal Arch Masons. 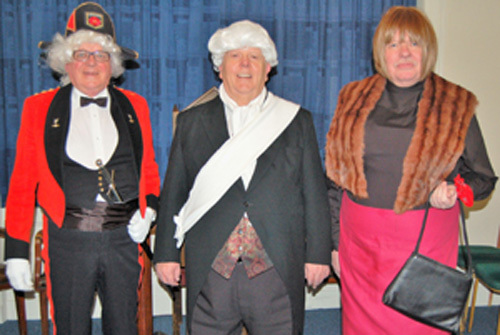 A raffle held during the festive board raised £360 for the MCF 2021 Festival. To conclude the evening, Paul was presented with a bouquet of flowers for his wife and a bottle of whisky for himself. The final toast of the evening was in the capable hands of the janitor Tom Lunt. Pictured from left to right, are: Ian Black, Andy Whittle, John Goodrum, Paul Renton, Ian Lynch, Sam Robinson, John Gibbon, Peter Williams, Mike Cunliffe and Neil MacSymons.